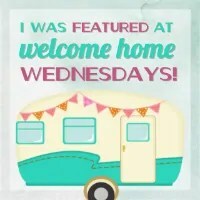 Welcome to Welcome Home Wednesdays #57!!! So happy you all stopped by today! I’m off to the Blended Conference so wish me safe travels! Can’t wait to meet all the fabulous bloggers there! Have a great week! Like any good hosts we’re sitting right by the present table waiting until our guests leave so we can go through the loot… the loot being your Welcome Home Wednesdays #57 links! We can’t wait to check out what you’ve left for us. Trust me there will be a lot of pinning, tweeting and facebook sharing going on in the near future… we can’t wait to show off what you’ve left! Thanks for hosting. Have a great week. Remember to laugh often.It is great cardio! Lol! I love all your bits of advice and inspiration, Marilyn! Hope your day is a super one! Thank you for hosting Erin, have fun at the conference!! Thanks for popping by, Katrin! Love seeing your smiling face! Glad to be joining your party this week! So glad to have you, Jennifer! We hope to see you next week too! Have a wonderful week! Thanks for partying with us, Dianne! Hope you have a great weekend!